During the summer and fall of 2017, DLLT conducted a survey of community members and other stakeholders to solicit feedback on our work, projects, and stakeholders’ interests in our future trajectory. The survey was conducted in-person at public locations around Grand Lake Stream, and DLLT interns went door-to-door among camps along the lakes. In addition, surveys were mailed to every mailbox in our local area code, and an electronic version of the survey was distributed to the DLLT emailing list. In the end, we collected more than 400 survey responses through these efforts, providing helpful insights and constructive critiques to inform our work. Twenty-five percent of respondents owned camps in the Downeast Lakes, and 17 percent lived locally year-round. The largest contingent of respondents were repeat visitors to the region, with 41 percent reporting they had visited the area two or more times. When asked what outdoor activities they enjoy in the Downeast Lakes Community Forest, 17 percent cited fishing, compared to 15 percent who enjoyed viewing and photographing wildlife and 14 percent who made use of DLLT’s hiking trails. ATVing and snowmobiling were enjoyed by fifteen percent of respondents. Seventeen percent of survey-takers had attended DLLTs education programs and events, and one-fifth of respondents had donated to DLLT to support these programs and the other work of the land trust. Encouragingly, the responses from this sample of stakeholders indicate continued, strong support for conservation in the Downeast Lakes: a majority of respondents cited “protecting shoreline from development” as more important than other land trust activities such as supporting economic development or promoting outdoor recreation-based tourism. Seventy-four percent of those surveyed said they would like to see additional land conserved by working forest easements, and a 68 percent majority favored expansion of the community forest, a move that would give the community greater voice in local land management. 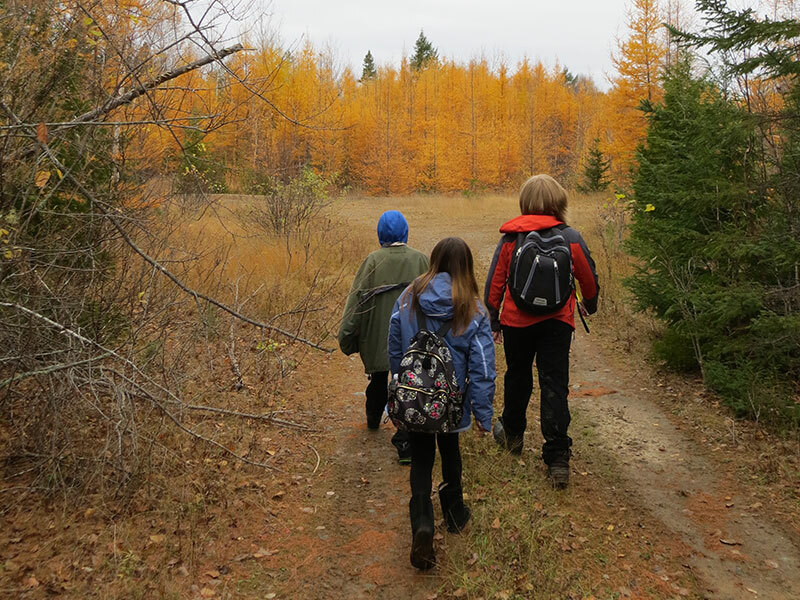 Since the purchase of the West Grand Tract of the community forest in 2016, DLLT has worked with partners to construct 4.6 miles of new hiking trails, and 64 percent of respondents said they would appreciate having even more hiking trails and campsites to explore in the Downeast Lakes Community Forest. This interest in recreational opportunities extended to DLLT’s public programs, as well. When presented with a selection of program offerings and asked to choose which they would most like to attend, a group outing such as a hiking or paddling excursion was the most popular choice, more popular, even, than presentations on local history topics like the well-attended recent discussions of the “Great Mars Hill Bank Robbery” and John Dudley’s “History of the Airline Road”. 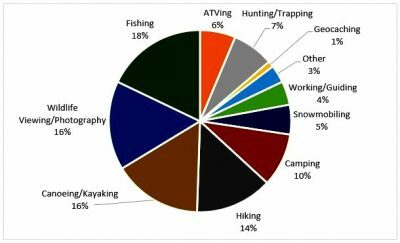 Outdoor recreation activities enjoyed in the Downeast Lakes Community Forest by respondents to DLLT’s 2017 Public Outreach Survey. Results also revealed a high rate of participation in our educational programs for children. Thirty-six percent of respondents who said they have children or grandchildren in the local area report that those children have attended at least one DLLT program. However, this figure revealed even more room for improvement, as 44 percent had heard of these programs, but their children had not attended them, and 20 percent said they had never heard of our children’s programs! This is all the more reason to spread the word about these great, free opportunities to connect kids to the natural heritage of the Downeast Lakes! The 2017 DLLT Public Outreach Survey offered a brief snapshot of our stakeholders’ feelings about DLLT, what aspects of our work are succeeding, and where we can do better. Although some of the methods of delivery (and respondents’ willingness to take the time to fill out the survey) imply a slight bias toward supporting DLLT, we also appreciated the feedback from those who expressed dissatisfaction with some aspects of our work. Their comments, pointed at times, raised some important questions and considerations for us to contemplate as we make plans for the future. Above all, we are deeply grateful for the input of all of our survey respondents. We always appreciate hearing feedback and ideas from the community, whether by phone, email, stopping by our office in Grand Lake Stream, or joining us for coffee and eggs at The Pine Tree Store during the summer “Breakfasts with DLLT”. Don’t wait for the next DLLT survey; stay connected and share your thoughts with us about how DLLT can best serve the well-being of the Downeast Lakes region. We look forward to hearing from you!